This is a great recipe to double, and freeze individual portions for quick defrost and reheat dinners. Try using leftovers in a shepherd's pie or even in fajitas or tacos. I like to marinate the roast in a 2 gallon Ziploc bag, which makes the rotating of the meat easier and prevents leaking. Using a needle or skewer, stick the meat all over. Place in a bowl or glass loaf pan just large enough to contain the meat and pour buttermilk over it. Allow to marinate in the refrigerator, turning occasionally, for several days. Remove from buttermilk and dry off meat with paper towels. In a heavy, flameproof casserole, brown on all sides in butter and olive oil. Remove meat from casserole and pour out browning fat. Add wine, stock, thyme and peppercorns, bring to a boil and skim. 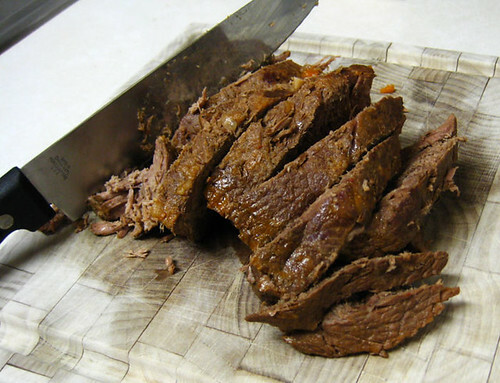 Return pot roast to casserole and bake at 300 degrees, covered, for several hours or until tender. One hour before serving add potatoes and carrots. Remove meat and vegetables to a platter and bring sauce to a boil on the stove. Spoonful by spoonful, add arrowroot mixture until desired thickness is obtained. Season to taste. Photo courtesy of Back to the Cutting Board on Flickr. This looks soooo delicious. I’m wondering: we can’t do dairy, would maybe ACV or water kefir work for an acidic marinade? I believe it would work yes! You could try my non-dairy creamy Italian blender dressing as a marinade… I think it would provide a lot of flavor! do you use the red wine called for in this recipe or do use sub it with something else? if do what do you sub it with? Kefir in place of buttermilk? This is going to sound dumb — but is the buttermilk you use the cultured kind (like they sell at the regular grocery store) or is this the stuff that is left over when you make butter yourself. I am new to this kind of cooking. Sorry!!! Sheila… not a dumb question at all! I used good quality cultured buttermilk from the store for this recipe. But if I had raw milk available and I was making butter, I would DEFINITELY use the buttermilk from that as it would have a ton of nutrients in it. It would be thinner though than the buttermilk from the store. Try not to buy low fat buttermilk if you can. Rule of thumb, no low fat and always buy buttermilk with active cultures. Sheila, you can also use homemade buttermilk from making butter if you cultured the butter; the cultures are still in the buttermilk. I know from experience from being shocked by the lids bursting off my buttermilk jars! Can I substitute if i don’t have buttermilk? (Making buttermilk from whole milk and vinegar?) Or does the recipe need the cultured buttermilk? Jennifer… I don’t think it would be quite the same… you could try yogurt instead. Really any fermented dairy would work. also what do u do with the kefir after marinating the beef? Again, WARNING to anyone reading: red potatoes are a nightshade! I am going to try this recipie but with modifications.